Welcome to the Shikoku Environmental Partnership Office (Shikoku EPO)! 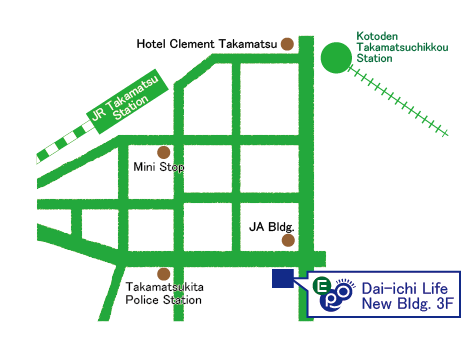 We provide a wide range of environmental information within Shikoku, and also nationwide. You will find all information you need here! And if by chance you do not find what you need, let us know and we will see to it that you get it! The Ministry of Environment has moved to forge environmental partnerships in regions nationally based on the act on measures implemented “Measures for Revitalization of Environmental Preservation Activities (mid-term report)” submitted by the Central Environment Council in December 2002 and the “Law for Enhancing Motivation on Environmental Conservation and Promoting of Environmental Education” passed by the lawmakers in July 2003. The ministry established seven partnership offices (see the map) nationally, with the Shikoku EPO in Takamatsu, Kagawa Prefecture, as one of them. The office was opened in January 2007. Shikoku EPO plays a role to liaise with the national government, including the Ministry of Environment, to share information as well as to promote coordinated efforts in order to foster partnerships with local citizens, NPOs, private companies, and other local public entities. Shikoku EPO supports collaborative efforts beyond the borders of municipalities or prefectures. EPO is set up in every region to cover the activities nationwide. ☆Shikoku EPO is entrusted to and operated by NPO Ehime Global Network (HP: http://www.egn.or.jp) with the support of other entities. 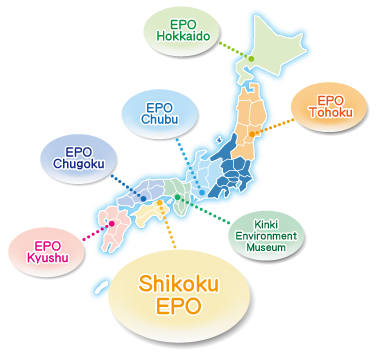 Shikoku EPO has eight main activities. As a center for environmental information in Shikoku. As a catalyst to connect communities with schools. As a driving force to solve problems through “connecting” with others. As a practical adviser to “mold your ideas”. As a place to see things from different aspects. As a place to learn a sustainable society. As a first step to get started. As a library or rental space. Please use public transportation as we do not have parking space for your car. Please use the room for your eco meetings. We have extra desks and chairs to tailor for your needs. Please talk to us for details. You can read/borrow documents and books on environment issues. We have a variety of books from picture books to white papers. ・Bulletin Boards and Leaflet Stands. Place your brochures of your events and seminars. We sort out the materials by prefecture, We have notice boards and help-wanted sections. Copyright (c) 2007- 四国環境パートナーシップオフィス All rights reserved.